Looking to upfit the roof of your van? Let us help you choose the ladder rack that best suits your needs at work! There are many types of ladder rack for commercial vehicles on the market. How do you know which one is the best for your specific needs? Are you trying to protect an old back injury? Do you need more than one ladder at your job site? Is cost an important factor in your decision? We have reviewed a selection of most popular types of ladder racks for you. The Challenge: When choosing a roof rack to best suit your needs, it’s important to look for a rack that can accommodate the materials you wish to carry. If it’s long, heavy building materials such as extension ladders, pipes or plywood, then it’s definitely useful to find a roof rack that makes loading your commercial vehicle much easier, and helps reduce the risk of back injury. Ranger Design’s Solution: Ranger Design’s newest roof rack, the Cargo+ is designed with ease of loading in mind. It’s unique and distinguishing feature is the one rolling bar at the rear of the rack. The material can be slide easily on the rack, as the rolling bar acts as an aid in loading everything with as little effort as possible. Trade Type: This type of roof rack is intended for a low roof commercial vehicle, and is best suited for contractors who work with construction materials. The Challenge: Definitely one of the most deciding factors of buying a roof rack is the cost. Many tradesmen only use their ladders on occasion, and therefore don’t want to spend more money than necessary on a roof rack for their commercial vehicle. Ranger Design’s Solution: The Ranger Design Cargo Rack is probably the most standard roof rack available on the market. Sturdy and dependable, this easy to use rack is one of the least expensive to buy. Built without any bars in the middle, it’s mainly used to hold either extension ladders or construction material. Trade Type: Tradesmen who use this roof rack are mostly contractors with a low roof commercial vehicle. They bring their ladder to the jobsite with them just in case, but may not use it at all during the day. The Challenge: A tradesman must look for a ladder rack that will be most practical and beneficial for their needs. Sometimes one ladder is not enough, and tradesmen are forced to leave in the middle of a job to pick up a second, or one of a different size. The solution to this expensive waste of time, is to look for a ladder rack that can hold multiple ladders on your commercial vehicle. Ranger Design’s Suggestion: The Combination Rack and the Double Clamp Rack are both created to hold 2 ladders. Typically, the Combination ladder rack is best suited for one step ladder and one extension ladder. The Double Clamp ladder rack is a slightly less expensive version, designed to carry two extension ladders. Practical and easy to load onto your commercial vehicle from the ground, these racks are extremely useful to tradesman, as it saves them the trouble of guessing which ladder length to bring with them to work. Trade Type: This type of ladder rack is mainly used by contractors who tend to work a lot with their ladder, such as window washers, electricians and builders. With ether of these racks, you can be sure that you will have the right ladder for whatever job comes your way. The Challenge: When choosing a ladder rack, you definitely want to look for one that meets the highest standards of safety. Not only should a ladder rack hold your ladder securely while driving, but there should be no risk involved in the loading and unloading process either. Ranger Design’s Solution: The Max Rack is one of fastest and safest commercial vehicle ladder rack available for carrying extension ladders. This drop-down ladder rack lowers the ladder in one single easy motion, eliminating any chance of back strain. As an extra safety measure, there’s no need to stand below to let down the ladder, ensuring no chance of injury in the case of a falling ladder. 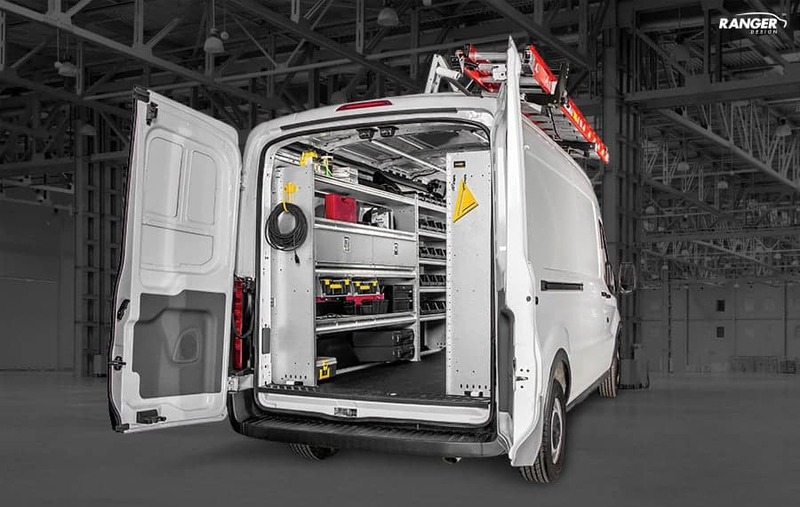 Trade Type: The Max Rack drop-down ladder rack is built specifically for high roof commercial vehicles, and for those mobile technicians whose ladder is the tool they reach for the most. The Challenge: Sometimes it doesn’t make sense to have a ladder rack, especially if you’re only carrying a step ladder. However, you still want to keep it tied down securely and in an accessible place that can be easily reached. Ranger Design’s Solution: The solution is the Access Pro ladder rack. This is an extremely simple, extremely cost-effective ladder rack that can be installed inside the vehicle. It attaches to the van ceiling, within easy reach at all times. Being inside, it also means your ladder will stay in better condition as it’s not exposed to the elements 24/7. 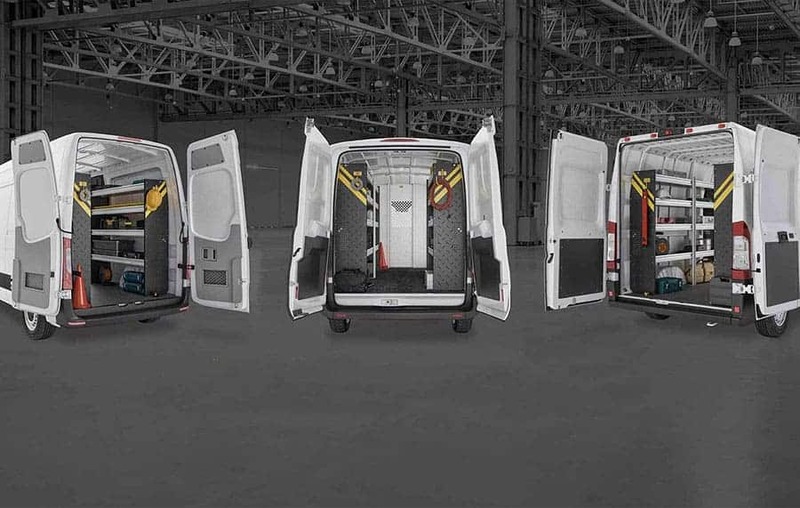 Trade Type: The Access Pro is perfect for tradesmen with box trucks, trailers or step vans. For those workers who don’t work high off the ground, and who need quick access to their step ladders, this rack is the perfect solution. Whatever type of ladder rack you’re looking for, you can be sure that Ranger Design’s got your roof covered! 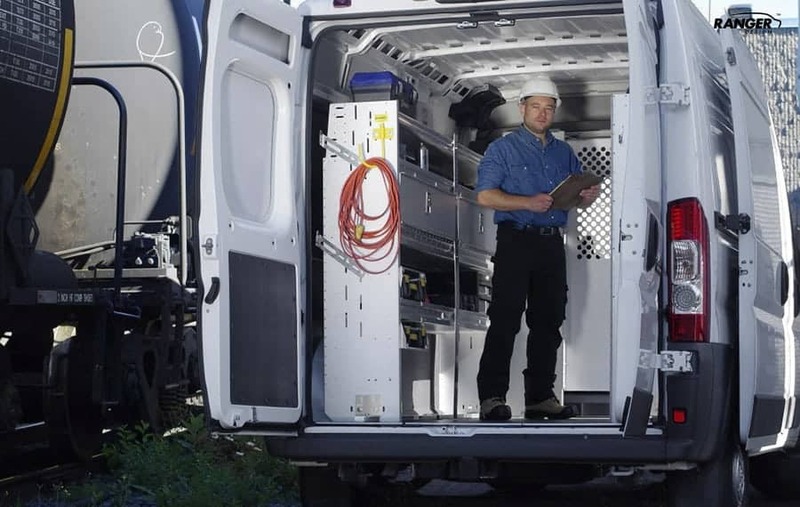 Looking for more products for the exterior of your van? The Max Step is sure to increase your safety as well as making loading and unloading a much easier process.